In the #1 Bestseller, The One Thing That Changed Everything, I tell my story on How to Sell Millions, Live in the Caribbean, and Build Wealth by Age 25.
" This book by Kyle Wilson and his fellow contributors can be a major turning point in your life, opening your mind and heart to the world of unlimited possibilities that resides within you. " 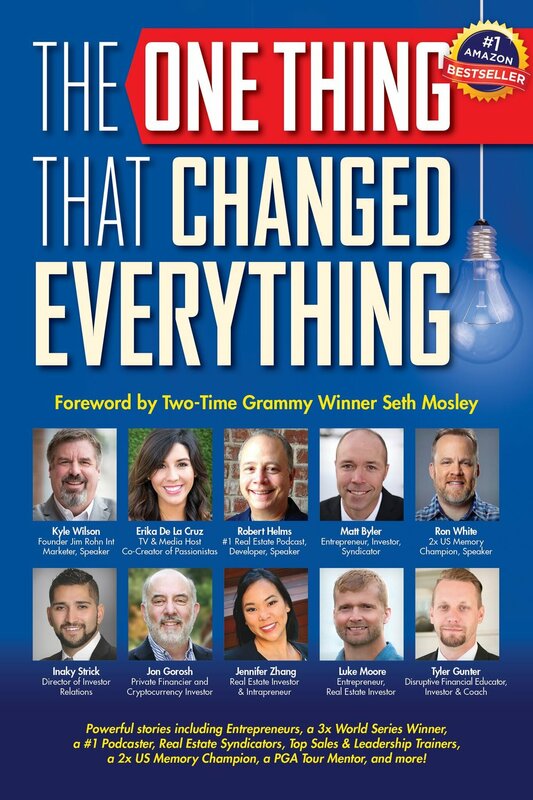 Fill out the form to receive a free copy of The One Thing That Changed Everything, schedule me to come speak to your organization, ask me a question about real estate, or simply say hello! 25:40 Inaky Strick tells us what he’s learned from attending live investing events. 34:25 How Inaky affords going to all these events. In this interview, Inaky Strick talks to us about the importance of taking calculated risks and how this can push your career forward. Inaky is a master at creating and building meaningful relationships and he shares some of his best networking tips. Inaky began with a real estate career at Martha Turner Sotheby's International Realty, Houston’s number one luxury real estate company with a global presence. During his time with Sotheby’s, Inaky represented new construction luxury builders such as Jeff Paul Custom Homes, T.D. Cox Custom Homes, Tommy Bailey Custom Homes and La Vie Villas. He then moved down to the Caribbean to become the Business Development Manager for Mahogany Bay Village; the largest and first luxury branded resort in the country of Belize. Inaky was the catalyst for the start of the business relationship between MBV and Gary Vaynerchuck, and American entrepreneur, four-time New York Times best selling author, speaker and CEO of VaynerMedia. Inaky then became the Director of Investor Relations at Four Peaks Capital Partners, a private real estate investment firm focused on acquiring undervalued cash-flowing mobile home park communities. Inaky raised over $4MM in 6 months from private investors. Inaky helps people build passive income and achieve financial freedom by connecting them with the best markets and teams to invest in real estate. Inaky is notorious for the friendships he has acquired and relishes the opportunity to afford them his expert hand in any and all of their real estate needs. His enthusiasm is evident believing the world of real estate is a people business always putting his client's needs as a top priority. Inaky ensures that he builds relationships for life. His goal is to help over 10,000 people invest in real estate. I was recently in Dallas, Texas for a Memory and Marketing 2 day event with 2x U.S. Memory Champion, Ron White, and Jim Rohn’s 18 year business partner Kyle Wilson. At this event we had the honor to be joined by Tom Ziglar, CEO of Ziglar Inc. and the son of the world famous personal development speaker Zig Ziglar. One day Tom Ziglar was speaking over in Australia at a Steve McKnight event. During one of the seminar breaks, a guy asked Tom a question. He asked, “Tom, what is the fastest way to success?” Watch the video to hear Tom's answer!